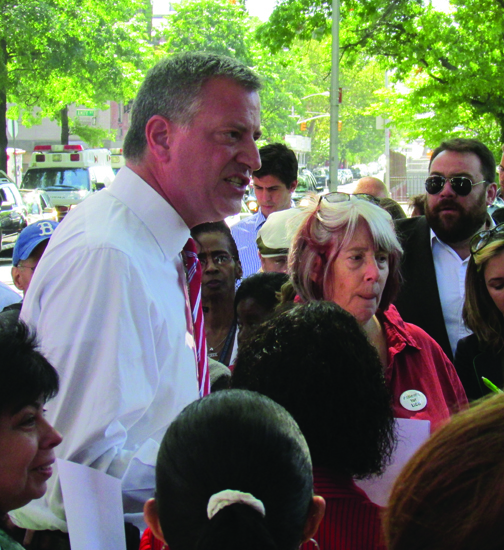 A bit after one pm, on the 6th of September, Public Advocate Bill de Blasio stepped up to the makeshift podium across from Long Island College Hospital and greeted his LICH supporters. 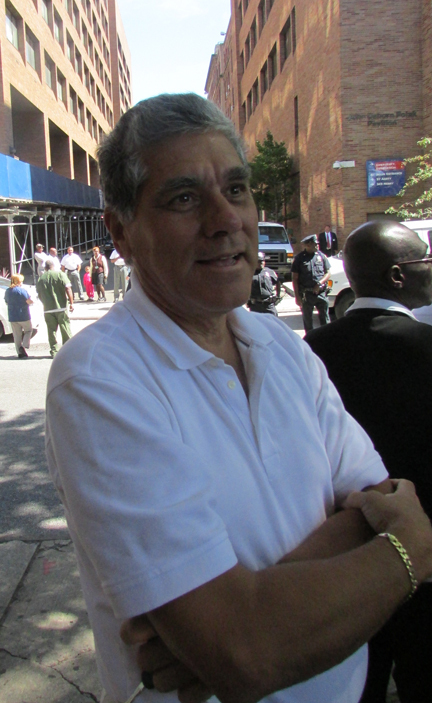 The group, made up of employees, former patients, local residents and politicians, and a press corps that grows bigger each week, meet across from the hospital on the Hicks Street side had been waiting patiently for de Blasio, who had been announced at arriving at 12:45 with a big piece of news concerning ambulance service. De Blasio greeted the crowd with a big smile and a big hello. The response was muted, and de Blasio looked up and wondered if he was in the right place “You are LICH people, right?” With that the place exploded with cheers and the press event proceeded, punctuated later by a LICH ambulance racing by with sirens blaring, also bringing raucous cheering. The big news of the day is another court order coming from Judge Demarest. Demarest is the judge who initially approved the transfer of LICH assets to SUNY Downstate, and on August 20th, reversed the transfer, citing SUNY’s bad faith in running the hospital, and their attempts at closing and selling off the real estate. Dr. Romanelli is still a bit suspcious, but listens intently. That original order which called for an immediate transfer, was later stayed by Demarest to September 6th, in order to give time for a smooth transition. Today, she extended the stay to the 11th, as per SUNY’s request, but with some very harsh provisos for SUNY Downstate. 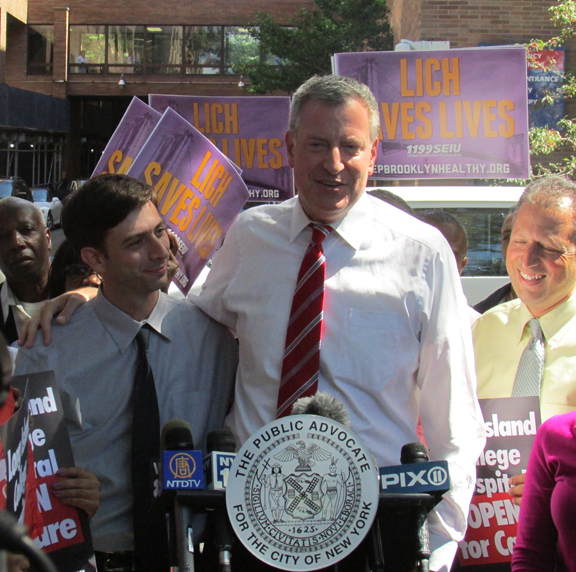 The order begins by requiring the resumption of full ambulance services at LICH as of 3 PM, September 6. The order goes on to request from the state Attorney General copies of all reports filed since 2000 relating to the Othmer Fund. The Fund was a bequest of over $150 million dollars given to the hospital in the 1990’s when LICH was an independent entity. It is speculated that the fund was ransacked first by Continuum and then by SUNY Downstate, both eager to get hold of the money. This gift was made by the Donald and Mildred Othmer, who lived a modest life in Brooklyn Heights. It so happens that they were friends with Warren Buffet and original investors with his Berkshire Hathaway company back in the 1950’s. Finally, the Order commands SUNY to provide the court with all responses to the RFP that was issued back in July seeking buyers for the hospital. She also demanded the names of the people will form a group to review and evaluate the proposals, and ordered that the group be a broad representation of all interests, with the paramount goal being “the charitable mission of LICH and the charitable intent of the Othmers. We also heard reports that two ombudsman, one requested by LICH and one requested by SUNY are on the premises to hear requests and complaints. At some point the judge will choose between the two. We also heard that there are 18 proposals, and finally that SUNY is trying to nickel and dime the doctors and nurses as respect to pay. Bill de Blasio takes on the expression of a bulldog as he answers questions from the press. This entry was posted in LICH, Politics and tagged Bill de Blasio, LICh, SUNY Downstate. Bookmark the permalink. Don’t trust Downstate. They are continually putting up obstacles. Judges like lawyers only deal with one issue at a tie, never looking at the whole picture. Don’t trust Judge William Thopson Sr. He worked for the company that helped to put Interfaith Hospital in financial ruin. Judge Baynes by not doing his judicial due diligence throughput these past months has allowed Downstate to defy justice. Instead of asking them to maintain the conditions present on July 19th, he should have demanded that they return LICH to the conditions present back in February (his original order). Shame on him!! The persons responsible for these decisions at Downstate need to be held responsible and prosecuted to the full extent of the law. There are certainly laws being broken – is there a law firm pursuing this? My Thanks to De Blasio, the only politician that is doing the right thing – and you can tell he really cares – and not just blowing smoke.